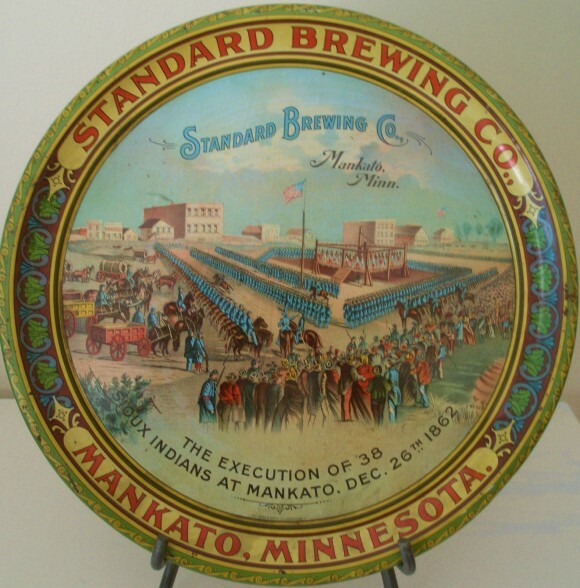 Serving Tray for The Standard Brewing Company out of Mankato, Minnesota. In the center of the tray it shows The Execution of 38 Sioux Indians at Mankato, Dec. 26th 1862. This tray features lots of action, color and even an elaborate border, truly a beautiful tray. Standard Brewing Co. was in business from 1900-1908 so this tray should date to that period. This is a pretty rare tray and is quite valuable. For more information check out this article on Slate.com that talks about the event.